Most exhibitors at NRF 2017 were hunting for big game. For three days straight, they hoped that CIOs from the big boxes and everyday brand-name retailers would show up at their booths, large entourages in tow, eager to buy their newest enterprise solution. Meanwhile, a startup from Ireland, Pointy, was in hunting and gathering mode. Their target client is the world’s mom-and-pop and specialty stores. Their solution: make local retailers more visible in online searches, starting right at the POS. Pointy, with its “find it locally” tagline, adds an online dimension to scanning by automatically posting scanned SKUs to the retailer’s own branded Pointy website. Along with the retailer’s basic info such as phone number and hours of operation, their Pointy site lists all products, including product photos, for any SKUs already scanned at POS. So, as the retailer rings sales normally, they’re also building their online store. Of course, if the retailer already has its own website, the Pointy store can include a link to that as well. 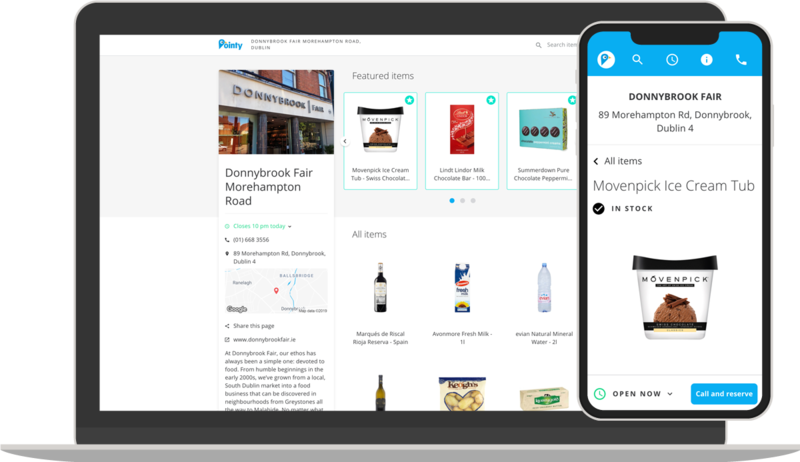 Pointy claims that over 320,000 customers have found products at local stores to date. 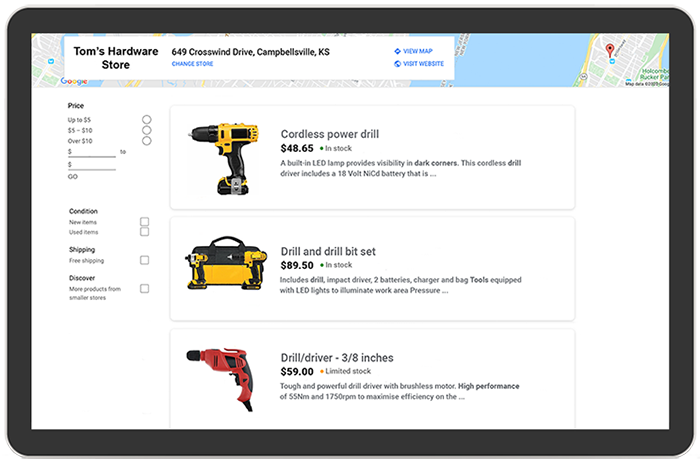 In fact, when testing a few searches for specific products in a zipcode where there is already a Pointy customer, the store, with a direct link to the product, does appear on the first page of results. The solution starts by connecting their device, a small rectangular box with an antenna and USB connections, between the scanner and POS unit. Why the antenna? Because the device is already connected to a cellular network. Actually, that’s all there is to the install. While the company does have support for installs in the field, many new users have found that they’re able to unbox and install Pointy without any help. The Pointy system recognises original, manufacturer-issued barcodes only. Once scanned, the system automatically adds the SKU to the retailer’s online store. If it’s already in Pointy’s system, it will appear online almost instantly. If not, it will be added to the website as soon as it has been located and added to Pointy’s central database. Inactive SKUs will roll off the store’s site automatically, if the item hasn’t been scanned for past thirty days. This ensures that customers are seeing current offerings. Of course, the retailer doesn’t need to wait until every SKU sells. They can scan items as if doing a cycle count in order to populate their store’s site. To date, the only category Pointy does not support is fashion. The pricing model goes against the subscription trend. Retailers buy the Pointy device for $299, and there are no ongoing costs. The cellular network connection is also included in the device purchase. Pointy believes it will reach a thousand customers in the near future. With a U.S. office in San Francisco, it’s in fifteen U.S. states so far. For those small retailers who didn’t make the trek to New York for NRF and happen to find the Pointy booth among the more visible retail systems giants, you can say you discovered it at The Bar Code News. Visit Pointy at Pointy.com. Eric Moody has been active in the retail systems world for more than 20 years as a writer, marketer, and enterprise sales rep.